This Block is made from two easy to piece units. In my book Simple Strategies for Scrap Quilts one of the strategies I suggest is to use a common background with what I call “related fabrics”. When I use the term “related fabrics” I don’t mean the new collection from one manufacturer that just arrived in your local quilt shop. “Related fabrics” can be 1930s’ reproductions, batiks, Civil War, plaids, polka dots, bright children’s prints and just about anything else similar enough to group together. 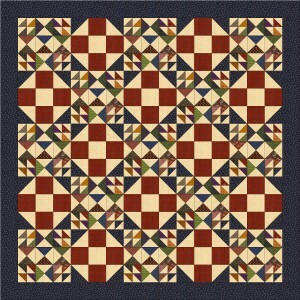 For this block I used my collection of Civil War fabrics with a common background (Olde Townhouse by Paula Barnes for Marcus Fabrics). The background is lighter than all of the other fabrics. I have made quilts using bright children’s prints with a black polka dot background. The background can be light or dark. You just need contrast to create a clear pattern. I love playing with different sets for a block. Maybe one of these will inspire you. Straight set with sashing and red corner stones. The red corner stones act as a center creating an alternate pattern. I always find this interesting. On point with sashing. 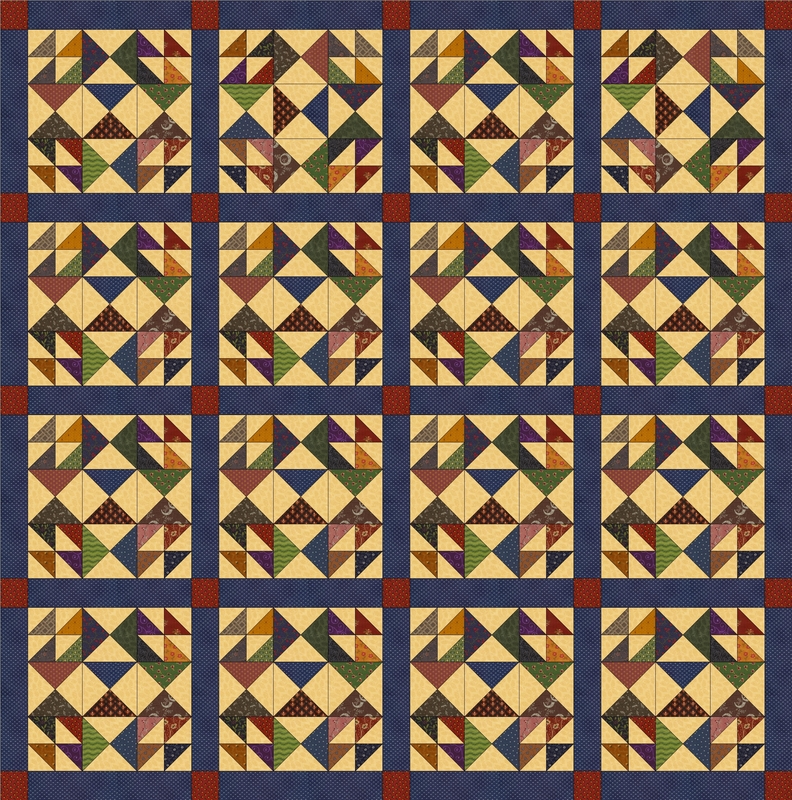 This gives you a larger quilt with fewer blocks. If this quilt hangs in a show the diagonal lines will catch the viewers eye. 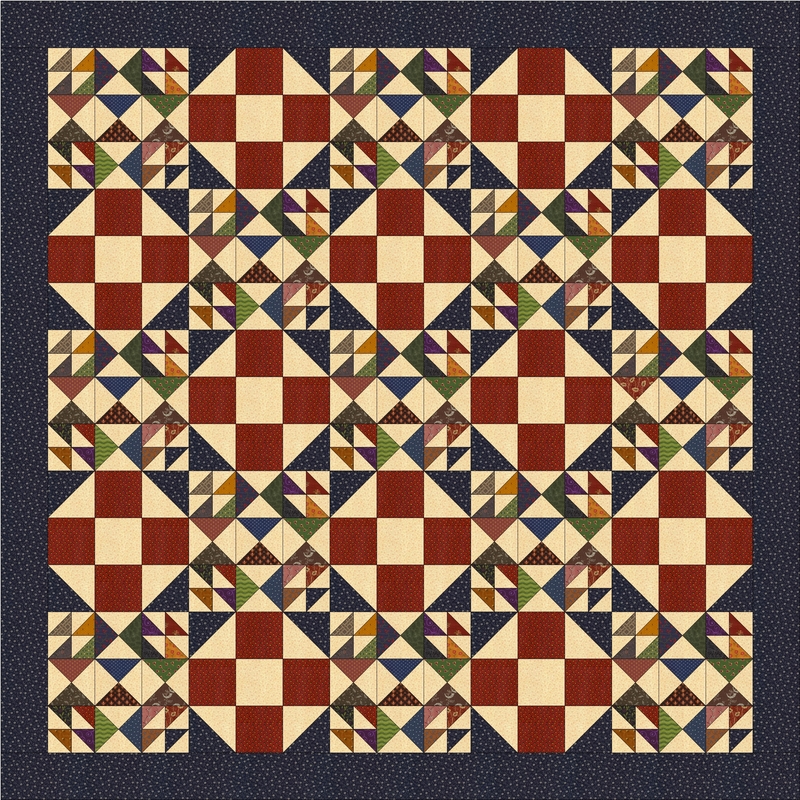 This quilt appears to be on-point but it is really a straight set with an alternate snowball block. Another straight set with an alternate block. I like that alternating with the snowball. love your block, I love scrap quilts. Absolutely LOVE this block, my favorite so far, thank you! I like your block and the different variations for the settings. Thanks for sharing. Your block looks great. I especially love the last layout very much! 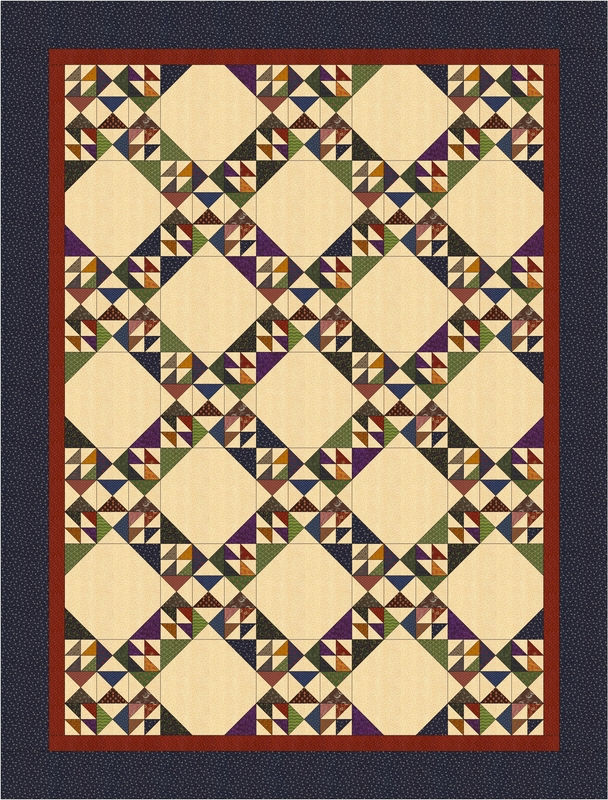 I love scrap quilts and using the “controls” you suggest can make really nice quilts. Sometimes though I just put things together and let them do the work and if the scraps are small they usually work well. Great block–love the different settings you show!! Wonderful block. I really like the scrappy feel of it and thanks for showing different layouts. Your block is so awesome! I really love scrappy. Thank you for the giveaway. I enjoy seeing your block in different settings and like it set on point with sashing the best. Thank you for the chance to win. Love the block. Thank you for showing so many ways to combine it. Very nice! I especially like the quilt with the alternate blocks added. Nice block! 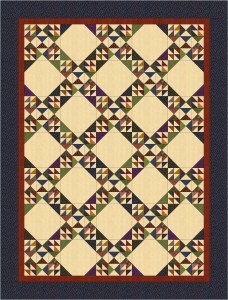 I’m looking forward to getting a copy of Quiltmaker’s 100 Block magazine as I love seeing all the different blocks. What a very interesting and pretty block. Congrats! I love how versatile this block is. Wow ty for sharing the many ways you can use this block…. nice…. Thanks for sharing the different sets for using your block, I like your block, it looks hard until you break it down. I need your book Simple Strategies for scrap quilts. I need help deciding how to use My stash of assorted fabric. 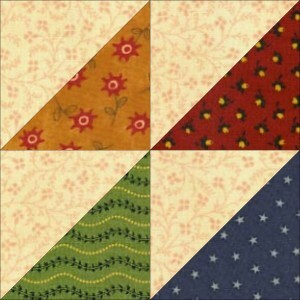 I love this scrappy block! It sure looks like a difficult block until you break down the easy to make units. Beautiful! Glad to find your blog. I love scrappy quilts the best. Obviously I also love scrappy quilts. I have been making them for 25 years. I took a class from Sharyon Craig and knew that was what I wanted to do. I like the version on point with a snowball. I think that might be my favorite. The block looks more like sashing than a block. I really love your block. Totally my style! I love all the possibilities! My favorite is the on-point with sashing! Very cute block! Lots of color options. Nice block! I can use up some of my HST left over from other projects!! Absolutely!!! I have bags of HST in several sizes. It is great your husband and son are doing something together and learning history while they are doing it. 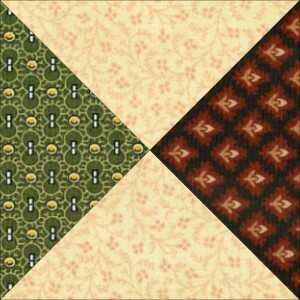 This block is perfect for reproduction fabrics. I love it in the sashing look! Thank you! Your block looks so complicated and yet, as you pointed out, it is made with easy units. 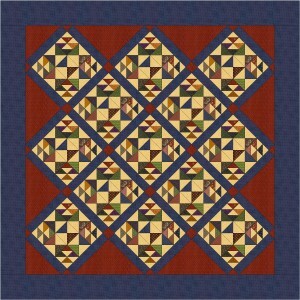 I love scrappy and pieced blocks.I will be making this! If you use the block in a quilt, be sure to send me a photo. Block has my favorite piecing designs and I love reproduction fabrics…. Wonderful block! It is amazing that you can create something so complicated looking from just 2 pieced units. I like the on-point look. Would be a great way to use my box of HST’s. Thank you for breaking down the block into 2 parts. That definitely makes it easier! Congratulations on being chosen for the magazine! Great block set!! I think I would like this made up in my scrappy blues with a beige background or even a pale blue background to make it all blue!! Sounds good!! If you do it I would love a photo. If you are only using two colors the beige could also be scrappy. Just be sure all of the blues you use are darker than all of the beige fabrics. I am usually drawn to ‘traditional’ blocks, so your setting with the sashings and red cornerstones captured my attention. It is a nifty block, and I love your civil war reproductions use. I have quotes taped to the side of my fridge. If I am having a bad day I just stand there and read them. I like that you use civil war prints. Very helpful tips to making a scrappy quilt more “together”. I like the striking diagonal sashing on your 2nd example. This is a great block! I really like geometric designs. Very nice block. I especially like the last quilt. It is amazing how one block’s look can change just by alternating it’s position or color. It was fun to see all the possibilities. It is fun to use a computer program like EQ where you have endless fabrics, colors, where a block like yours can shine. Thank you so much for sharing your talent with us. That’s fantastic, thanks for the tutorial. I like the on point with sashing version. An eye catcher for sure. Oh, I like that alternating with the snowball. Very nice! I like how the pattern shows up in that last layout. It creates lots of movement w/o wearing out your eyes. Very cool block, love the different layouts. Thanks for sharing. Fabulous block and all your setting are great. Isee it in scrappy fabric combo. This would be a great patriotic quilt. Thank you for sharing. this may be my favorite pieced block to date. Love it. I love this block and your use of reproduction fabrics. Thanks for sharing several setting options. I like them all, but esp. the on point quilt. Nice job! Great way to make use of scraps of fabric, with a common background to tie them together in this very versatile pattern. Thanks for showing so many alternate settings for your block. Love the block itself. What a cool block that is super versatile. You have a winner block in my eyes. All of your layouts are great. I really like the one that alternates with snowball blocks and looks on point! I like how scrappy your block is. Love your color choices too! I love to see simple-to-make scrappy blocks! I could easily make the last quilt shown in this post. This is a great block, I love scrappy! I enjoy seeing all the various layouts too, gets me inspired to play around with blocks. Thanks for sharing all the options for your fabulous block. Leaves lots to think about with respect to colors and placement. Your block to me looks like a great scrape quilt “T” of the civil war era. I would be fun to make in red, white and blue for the wonderful USA I live in. Thanks for sharing and your quote. May we all try to do our best. I like the second one. Great block! I really like the one with the snowball version! I like the block set on point, or the layout which is last that shows the alternate block. This is perfect for scrap quilting – you can make the parts of the block with leftovers from other quilts and then put the pieces together to make the block. Fantastic. Great block. Thanks for sharing the alternate layouts. I love scraps, scrap quilts, and the wonderful results! I don’t many civil war print, but I do have a huge collection of 30’s prints I’d like to make a dent in. Thanks for showing all the different layouts– it helps to see the possibilities. I would love to see your quilt in 1930s’. What a great block! I love blocks that look complicated but are easy to piece. Thanks for sharing. I love scrap quilts! What more can I say. I love your scrappy quilts, all of them. Scrappy isn’t really my thing. I like your block alternated with the snowball block. I think it would look great in shades of blue or green with white snowballs. If you make it I would love to see it. Great block! Love the last option! from one scrap lover to another, love your block! Really versatile block. Like the civil war fabrics. LOVE the block! 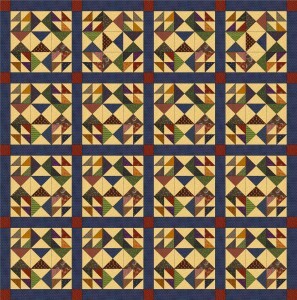 I really like both quilt designs with the alternate block. The timing is perfect I’ve been staring horrified at three large bags of scraps trying to think of something to do with them…I think I’ve found that something. Thank you! I loved the setting with alternate snowball blocks. Wow! So many great options. I love playing with block arrangements too. Very Nice, I love it! Playing with the blocks is almost like working a puzzle. So much fun! Loooove Scrappy Quilts!!! Yours is Awesome!! What an amazing block with all the possibilities! I especially like the straight set with an alternate block! to have some out of kilter ones! Great block. I always cut the hourglass blocks oversize and then trim them. The standard is to add 1 1/4″ to the finished size. I add 1 1/2″. So for a 4″ finished size I would cut the squares 1 1/2″. Spray starch will help with the bias edges. Spray the squares and let them dry before you cut them. I love scrap quilts and your block is a beauty. I love the scrappy possibilities for your block. Thanks for the giveaway. Love the block set with the snowball. what a great quilt! This really lends itself to “scrappy”, but would still be effective with a controlled palette as well. What would happen if there was no sashing at all in a straight set and no other intervening blocks? I did a version with no sashing. On the computer it seemed to loose the pattern. If you sew the blocks side by side there will be many angled seams coming together. The sashing makes it easier to piece a smooth flat top. I would press toward the sashing so that you are not folding triangle points. The quilt will be much scrappier if the blocks are sewn in a straight set. If you do it send me a picture. 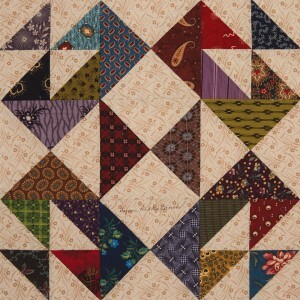 I love scrappy quilts, so this block is great! I love all the settings you’ve shown too! I love your block, especially in the settings with alternate blocks. What a great way to use up scraps! Love when different alternate settings are shown! I love how simple blocks make stunning designs when mixed together. I love scrap blocks. Your on-point version looks like a winner to me. I get lots of donated fabrics for my many charity projects– scrap quilts are my go to blocks…this looks like a keeper, especially if you consider the name Thank you. Wow your block looks so different in each of the settings and I like all the angles in it. I love the colors in this block. Very warm and cozy! I love seeing color switches and alternate layouts…it’s fun when a neat secondary design shows up. Congratulations on your block – I love the first version! I need to have a pattern to use some of my CW fabrics and this block will be great for it..yours looks really neat!! Your block is wonderful. 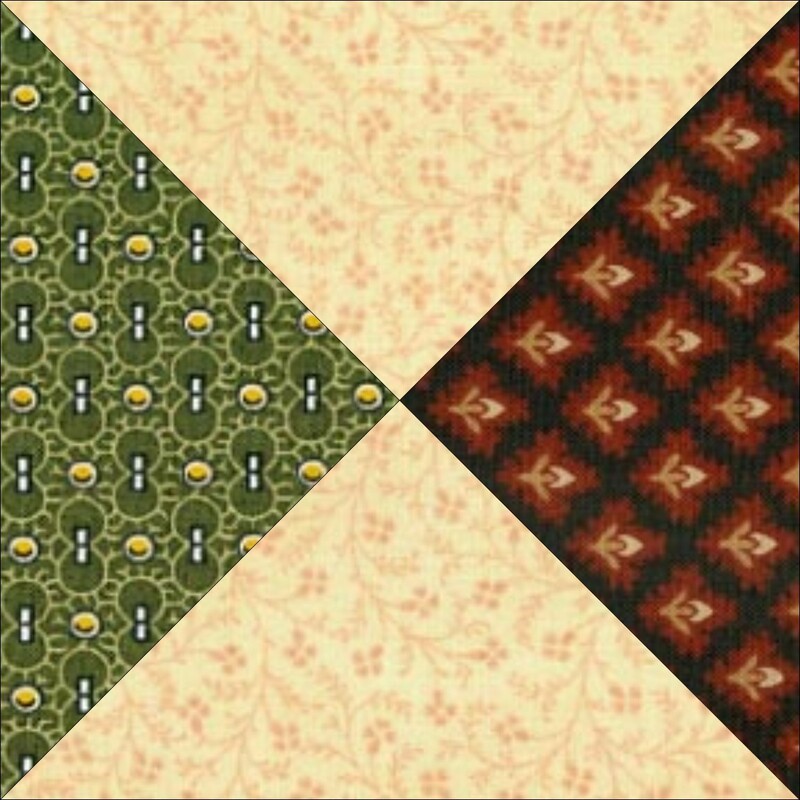 I love all the different quilt design that can be made with it. 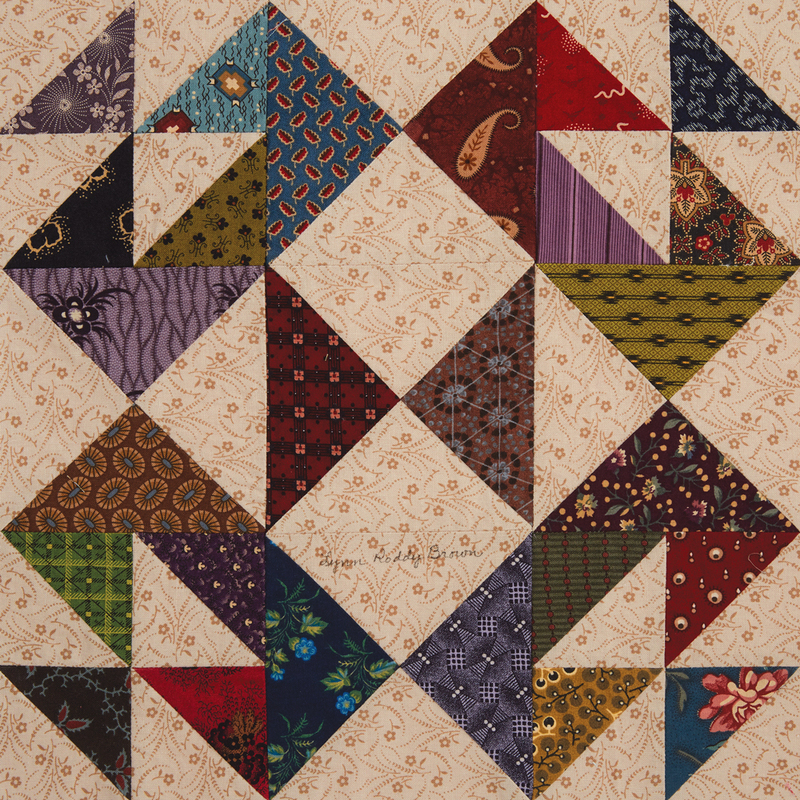 Fabulous block – thank you for sharing and congrats! Such a simple design to make but -oh so effective.